Here is a free offline virtual assistant Android app. You can use it as an offline alternative to Google Assistant. You can ask or type questions and it will response to those questions based on the available data. Whether you want to ask about the temperature, listen to a joke, or you have some other queries, you can ask for that and it will give you the answer. 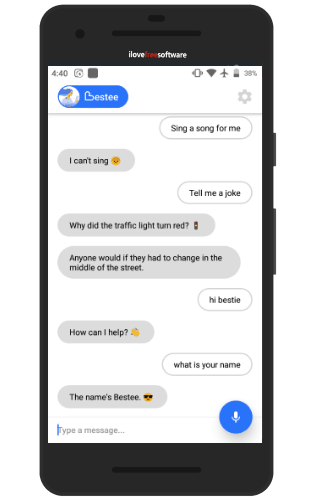 The name of this offline virtual assistant is “Bestee“. It also works with apps like Spotify, YouTube, etc., to play tracks for you. Just type your question or speak and it will do that. The results provided by Bestee virtual assistant are good. However, you may not get answers for many questions. For an example, it won’t sing a song for you. Still, the app is good if you care for your privacy. Also, it will be faster as the answers are already stored in the database and it doesn’t require internet connection to respond to you. It will be more and more useful with the updates. In the screenshot above, you can see the interface of this free app where I asked a few questions and it responded to me. How to Use This Free Offline Virtual Assistant Android App? Install this app by accessing its homepage on Google Play. You can also use the homepage link of this app given at the end of this review. When the app interface is opened, you can ask questions by typing or speaking (using the Mic icon). It will respond almost instantly which is what makes it better than other virtual assistants. Still, as per my testing, some answers were not satisfactory. You may try it by yourself and check how useful it is to you. In addition to that, you can also access Settings of this app to use other options. The Settings section helps to enable “Launch with keyphrase” option. 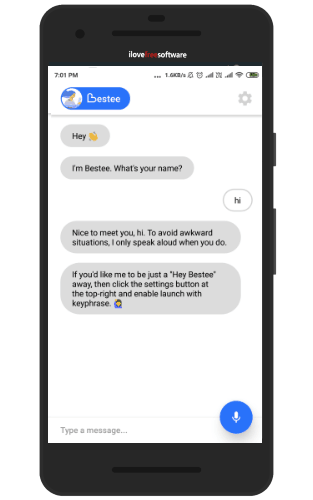 After that, you can use default keyphrase ‘Hey Bestee’ or set some other keyphrase to use this offline virtual assistant. You can also set keyphrase sensitivity, toggle vibration, and enable permissions for location, contacts, calendar, etc. We’ve also covered some good free Android personal assistant apps for you. I won’t say it is a strong replacement to other popular virtual assistants like Cortana, Google Assistant, and Siri. There is still some more work to do. Still, those who want to try an offline virtual assistant Android app for privacy and which doesn’t require an active internet connection to answer your queries, then this app is good to try.